Our employees are caring, competent people with deep roots in the area. Following is a brief biography of each of our staff members. Bob was born and raised in Auburn. He is the third generation of his family to be in business in Auburn. 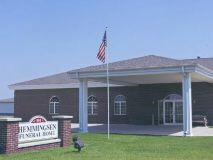 Bob earned his Nebraska Funeral Director license in February of 1997 and opened Hemmingsen Funeral Home in April of 1998. Carol was born and raised in rural Johnson. Carol attended Peru State College and earned a degree in elementary education. Carol teaches second grade for Nemaha Valley public schools in Cook. Derek has moved back to Auburn and is now working full time with his father. Derek earned his Nebraska Funeral Director license in November of 2008.